While it’s a nominal change, the average asking rent for an apartment in a building with over 50 units in both San Francisco and the East Bay slipped at the end of 2015 as a post-recession wave of new construction, the pipeline of which has hit a record high, has started to impact vacancy rates. And employment, at least in San Francisco, appears to have stalled. The average asking rent for an apartment in San Francisco ended 2015 at $3,616 per month versus $3,623 in the third quarter of the year as the vacancy rate ticked up from 4.1 to 5.6 percent, according to data from Cushman & Wakefield. The average asking rent for an East Bay apartment ended 2015 at $2,085 per month versus $2,105 in the third quarter and the vacancy rate ticked up from 3.0 to 3.4 percent. The average asking rent in Alameda County, which includes the red hot Oakland, slipped to $2,226 per month, down from $2,257 per month the quarter before. Bit odd that in SF County & Contra Cost County the average rent for a 3BR/2BA is lower than a 2BR/2BA, no…? No. Newer buildings have relatively fewer three-bedrooms. And the newer buildings, with more (modern) amenities, tend to command higher rents, which helps drive the average two-bedroom up. 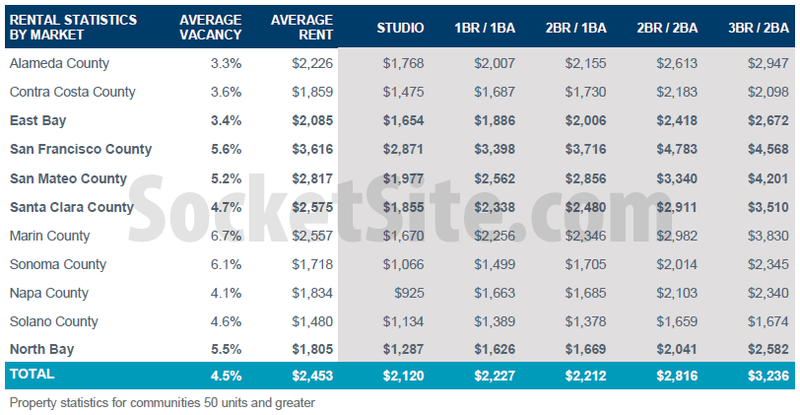 Funny that SF is the most expensive and has the highest vacancy rate. Proof that rent control is keeping costs inflated and restricting housing supply. Abolish rent control yesterday!! San Jose has very few units under rent control, and prices there have increased even more on a percentage basis than San Francisco. Theory debunked. Rent control is needed for social stability in certain places that experience extreme bouts of speculation. Wrongo. San Jose does indeed have rent control. San Jose’s rent control only covers about 43,000 units built before 1979 and excludes duplexes. So? Same thing for SF WRT pre 79. Point being RC still impacts the SJ rental market. Spoken like a true communist. Please bring rent control to SJ. I will buy and Ellis in SJ for fun and profit. Then you will cry Ellis is unfair – but you asked for me to come? This “proof” is not particularly compelling. Contra Costa County has a substantially lower vacancy rate than SF (3.6% vs. 5.6%) with rents that are only half as high. Marin has a higher vacancy rate than SF and much higher than CCC (6.7%) and rents that are 1/3 lower than SF but higher than CCC. Solano County has a lower vacancy rate than SF (4.6%) with rents that are about 60% lower than SF. The current vacancy rate is quite low for all of these counties, compared to the national figures. As far as I can discern, there is no correlation between vacancy rates in this range and rental rates. Drawing some further connection to rent control does not appear to have any support at all in these data. 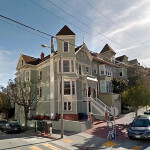 SF’s vacancy rate could be caused by the vacant old units as a rejection of rent control, and also newly built apartments which is to be rented. Rent increase is stalling, may reflect a ceiling of affordability, a slowdown of hiring and more renters becoming owners. You’re the worlds dumbest landlord if you would rather keep an apartment vacant because of rent control (especially in a place that permits vacancy decontrol) rather than rent it out in the most expensive rental market in America. They keep their units vacant until all the units in the building are vacant, then sell the building. They can make much more selling a building that is empty than full of rent controlled tenants paying $800/ month for a $3,000 unit. Err…no. They usually remodel the flats and sell them off as TIC’s, which are almost always owned by owner occupiers. Bye bye RC rentals! Spoken like somebody that doesn’t own a building filled with low rent paying folks that lawyers love to encourage to sue the landlord. Lawyers will only encourage tenants to sue you if there is adequate cause. Lawsuits are too expensive for lawyers to initiate for fun. I’m guessing you are a bad landlord. If you own a building full of “low rent paying folks” that is nobody’s fault but your own. BTW, nothing quite as tacky as disparaging the renters who provide your income. Spoken like someone who made a business decision without doing due diligence. He did. It’s called the Ellis act option. It’s 100% legal. Deal with it. The figures quoted above are for 50 unit complexes and above. Landlords are not holding those units of the market…it’s a business. (Folks argue that there are many in law apartments that are held off the market because of rent control/tenant protections but that is a completely separate issue). True but those bigger bldgs usually always have transitions/vacancies. Since they have many tenants they’d rather have a month or two vacancy then lower their rent…and potentially have 49+ renters asking for a rent reduction on their unit. So those tend to sit longer empty on the market. Spring-summer they will fill them up more. Rents and jobs go hand in hand. I expect the SF employment figures to show a smaller workforce over the next few months as we are seeing layoffs and office space contractions. Throw in the increasing residential supply and there will be more softening in multifamily rents. Its not about the behemoths like Apple or FB (though if they falter, Armageddon would ensue), but the startups with limited capital as they provide the workforce of incremental renters. Those startups can tighten their belts, but eventually they will need to raise more money, and the VC picture is not pretty. Being “pre-revenue” is so 2015. So when they start to disappear/shrink, so will their $150K/yr 24 year olds renting the $4K/mo 1BRs. I wish it weren’t the case, but already sublease office space is increasing big time, which portends softening in rents all over. There might not be a pop, but this bubble is already letting out hot air. 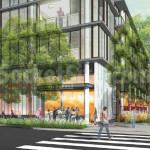 Interesting about sublease office space increasing big-time. did not know that but if true its probably that SF is too expensive to do business in for many companies as well as too expensive to live in for many workers. I take heart that the projection of SF going to a million residents in 15 years will prove false. Especially if job growth significantly slows over time compared to other areas. Reno is set to add up to 50K workers over the next 6/7 years. There is job growth occurring but SF may have peaked. For a while anyway. The rental vacancy rate in SF is 2.5%, per US Census ACS 2014. The numbers in the table above are only for buildings with 50 units and greater. Most likely somewhat elevated by the number of these new larger buildings in SoMa and MB. Wages region-wide are not keeping up with rents. No surprises that rents are slipping as people double up or find cheaper options.